THE FLAT EARTH HYPOTHESIS: SEEING IS BELIEVING! Thanks to a Facebook friend, I am going to take this opportunity to make what I think are some very important points about seeing, believing, and the scientific paradigm of the mainstream establishment. People all too often don’t question the prevailing scientific paradigm, because, after all, it brought us television, computers, smart phones, etc., etc., …and mainstream scientists have spent virtually their entire adult lives studying science, so surely, they must know what they’re doing, right? Wrong! They are just as fallible as anyone, and because of academic specialization, they tend to have tunnel vision and are often not very open minded. This Facebook friend deserves credit for bringing up the flat-earth hypothesis is spite of the ridicule he’s sure to get from people who think they know the Earth is round. He deserves even more credit for having an inquiring mind, and not just accepting what the scientific establishment says, but wanting to see the truth for himself. It is very easy to just laugh at him and say, surely no one in this day and age really believes that the Earth is flat! That’s been disproved ages ago! The Earth is just one of the planets orbiting the Sun. Hasn’t he seen Star Trek, or Star Wars? 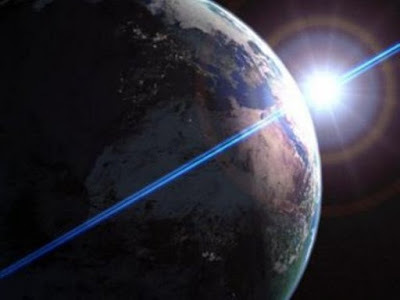 Of course Star Trek, Star Wars, and other science fiction movies that show the Earth like a ball suspended in space, were not actually shot from outer space, those images are just special effects. And NASA could certainly produce such films and pass them off as real if they actually have not gone to the Moon, or sent an unmanned probe to Mars. There may or may not be a massive conspiracy and cover-up going on; maybe we’ll get to that later, but first, let’s consider my FB friend’s position: He has taken the position that seeing is believing and has stated that the Earth looks flat from 100,000 feet up. Furthermore, he contends that the fact that no curvature can be seen in the horizon from that altitude proves that the Earth is actually flat because, he believes that if the surface of the Earth were curved as scientists say it is, you would be able see that curvature from 100,000 feet. But, is that true? The Flat-Earth people apparently believe it is, and it sounds right. But, if we’re going to reason this out, we can’t just accept it as true because it sounds right, we need to think of it as a hypothesis and actually prove it either true or false. The belief that, if the surface of the Earth is curved, then we should be able to see that curvature from 100,000 feet up is based on the idea that light always travels in a straight line, at a constant speed. It turns out that this is not always true. It is usually true in everyday circumstances, like looking across the room or down the street, but looking at the horizon which is a great distance from you, from 100,000 feet (18.9 miles) up, is different. There are several physical phenomena that cause light to slow down and follow a curved path and significantly affect what we see when looking at the horizon from 100,000 feet up. These phenomena are either too minor to be noticed over short distances, or non-existent in our normal environment. The most relevant one in this case is refraction. Refraction is what makes a straight straw in a glass of water look bent. It happens because light moves more slowly in a dense medium. In our case, the atmosphere of the Earth is like the water in the glass, except the atmosphere is most dense at the surface of the Earth and thins out to nothing at about 327,360 feet. So, light coming to the eye of an observer at 100,000 feet from the horizon is curved as it passes through the atmosphere, making the horizon look even farther away than it really is. This makes the horizon look flat until you get high enough that, looking straight down, the Earth will look round regardless of which model is correct. Why is this so? Imagine you are standing on a huge ball, a few miles in diameter. Depending on the actual size of the ball relative to your height, if you are tall enough, you will be able to see the curve of the ball. Now, suppose you are instead, standing at the center of a flat, circular disc shape, like the Flat-Earth model shown on the various Flat Earth Societies’ websites, with it horizontal diameter the same as the diameter of the ball. Because the surface of the disc is flat, you will have to be taller to see the curve of the edge of the disc than you had to be to see the curvature of the ball, but if you are tall enough, or you stand on something to gain enough altitude, you will see the curved edge, just like you did on the ball. The fact that at a certain height above the surface, the Earth will look round regardless of which model is correct, means that to use this approach to prove which model is actually correct we will have to calculate the heights at which we can see the curved edge for both models and then go to those heights to see which one is real. But, different from standing on the ball or disc, to accurately determine those heights above the surface of the Earth, we will also have to calculate the proper adjustment for the curvature effect from the light passing through the Earth’s atmosphere for each observation, since the density of the atmosphere varies with height. As I mentioned above, the atmosphere thins out to nothing at about 327,360 feet. This has been determined two ways: both mathematically by calculating the effect of gravity on the gasses of the atmosphere, and by direct sampling with measuring devices called sondes, attached to balloons. Calculating the respective heights for observing the edge of the disc or the curvature of the sphere, and flying high enough to check them out would be a fun experiment and would give us an absolute proof positive answer. But before we try to get funds to do it, there are other less labor-intensive ways to approach the problem of determining which model is correct. Perhaps the easiest one is the sunrise experiment I proposed in an earlier FB post. It doesn’t require funding or high-flying observations, just cooperation from a couple of friends or acquaintances. Just have someone in New York City and someone in Denver call you on the same day at dawn at their respective locations. If the Earth’s surface is flat, the calls will be virtually simultaneous because there are no mountains high enough between Denver and New York to block the line of sight. If the Earth surface is curved, the call from Denver will come in after the call from New York, because the sun will be hidden behind the curvature of the Earth until it reaches the height necessary for it to be seen in Denver. If the Earth is nearly spherical, the calls will be about 2 hours apart. If you try this, you will find that the time between the calls will actually be about 2 hours, give or take a few minutes depending on exactly where your friends are located in the Denver and New York areas. I can say this with confidence because I have been in both Denver and New York City a number of times, and I have friends in both areas. It is always necessary to allow that same amount of time difference if you are in one area and want to connect by telephone or skype at a specific time with someone in the other area. If the Earth were flat, the sun would be seen to rise at the same time in Denver and New York, but would reach the zenith (straight overhead) about 2 hours apart in in the two locations, Denver 2 hours behind New York. So the diurnal time difference would vary during the day, making synchronizing watches for a given time to schedule a phone call between the two locations very difficult. Obviously this is not the case. Conclusion: the surface of the Earth is effectively the surface of a sphere.